You no longer have to live with dentures that slip in your mouth, cause painful sores and have minimal chewing power. Modern technology has made it possible to eliminate the problems with traditional dentures by supporting them with dental implants. Implants hold your dentures stably in place, significantly increase their chewing power and help preserve the bone in your jaw. Depending on your needs, your dentures can either be fitted so they snap onto the implants while still being removable, or they can be permanently fixed onto the implants. 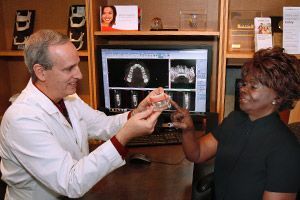 Dr. Schmidt and Dr. Lee can expertly place your implants and fit you with durable, comfortable and lifelike replacement teeth—all in the comfort of our office. 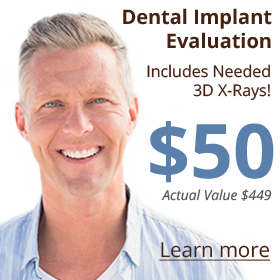 Dr. Schmidt and Dr. Lee are highly skilled and experienced in placing dental implants. 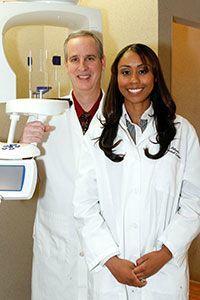 Dr. Schmidt and Dr. Lee are both highly skilled and experienced in placing dental implants. 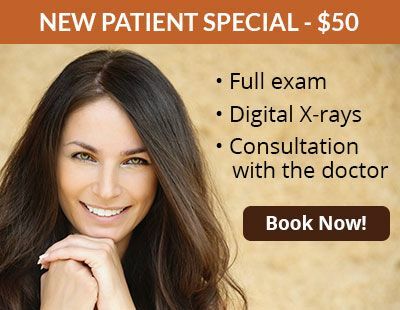 They have each taken extensive continuing education courses to ensure they are always up-to-date with the latest technology and procedures. 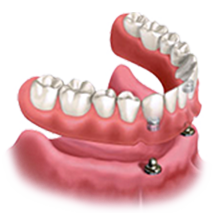 They have each achieved special recognition for their skills by advanced professional implant training organizations. Our doctors are also members of the American Academy of Cosmetic Dentistry. They not only ensure your dental implants are stably and successfully placed, they also ensure that your final new teeth are aesthetic, look totally natural and fit perfectly and comfortably when you bite or chew. For very complex cases, we partner with our in-house periodontist, Dr. Robert Vazquez. Dr. Vazquez specializes in implants and treating gum and bone. He provides implant placement or bone grafting as needed in challenging situations. The following are our implant-supported denture options. 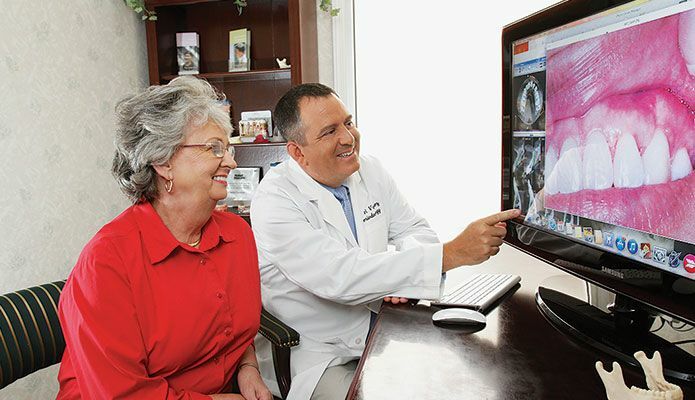 Our doctors will go over with you all of your options. Our doctors can place as few as four implants on your dental arch. These implants will support a new, full-arch set of high-quality, fixed-in replacement teeth. Known as the New Teeth in One Day procedure, this breakthrough technology makes it possible for most patients to receive implant-supported, full-arch fixed-in teeth without the need for bone grafting. This includes patients with severe bone loss, who would not have been candidates for implants in the past. These new teeth will provide almost full chewing power and will look, feel and function very much like natural teeth. Fixed-in teeth have no false upper palate to inhibit your sense of taste. Because of the advanced technology used in the procedure, our doctors can usually perform all extractions, place all your implants and have you walk out the door with new, functional replacement teeth—in one day! Learn more about New Teeth in One Day. The most economical full-arch replacement option is dentures that snap onto implants and are removable. Dentures can be made stable with as little as two implants in an arch. 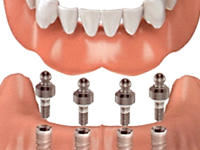 In order to eliminate the false upper palate, the doctors place three to four implants per arch. Our doctors create well-fitting, natural-looking dentures with snaps. Snap-in dentures can provide from 50 percent to 75 percent of normal chewing power, depending on the number of implants used. 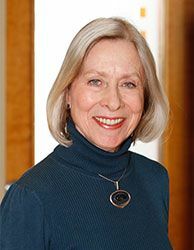 If you are currently wearing new dentures that fit stably and are in good condition, our doctors can stabilize them further with dental implants. With implants, the dentures will be firmly retained in place and will not slip. The dentures are fitted with attachments that snap onto the implants and can easily be removed for cleaning. A substantial amount of chewing power is returned and you never have to experience the discomfort of a loose denture. 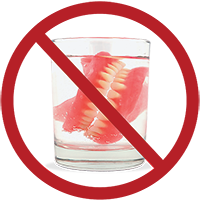 Learn more about denture stabilization.